Constructed in 1856 to manufacture lead shot ammunition, the Shot Tower is one of only a few remaining shot towers in the United States, and the only one west of the Mississippi River. 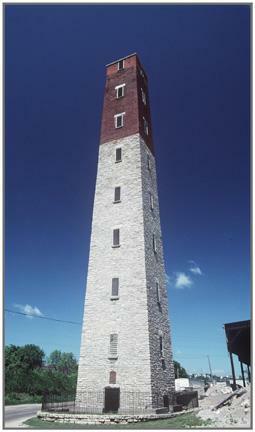 The 120-foot Shot Tower produced lead shot from 1856-58, and then was closed. It was briefly refurbished for use during the first year of the Civil War. It was used by the Standard Lumber Company as a fire watchtower from the late 1880s until the company was destroyed in the 1911 lumberyard fire. The tower stood deserted in its post-fire ruin from 1911 to 1959. The 1911 fire destroyed the original wooden stairs, leaving no ready means to access the tower interior for maintenance and repairs. In 1960-1961, the tower was repaired using methods that are now known to promote deterioration. Mayor Roy Buol declared 2006 as the Year of the Shot Tower in recognition of the structure’s sesquicentennial. The Shot Tower Rehabilitation Project will include the following, completed in phases: an archeological survey inside and around the tower, interior and exterior repointing and masonry repairs, a new roof, door and windows. Rehabilitation includes the installation of solar panels to power the Tower's lights.